Decibel Metal & Beer Fest: Los Angeles, presented by Metal Blade Records, continues its mission of pairing the most extreme minds in music and craft beer with Warborn Rye Pale Ale. Melodic death metal crew THE BLACK DAHLIA MURDER have joined forces with longtime Decibel partner Weyerbacher Brewing - who brewed the official beer for the Philadelphia festival in March - to create the drinkable 5% ABV rye pale ale. 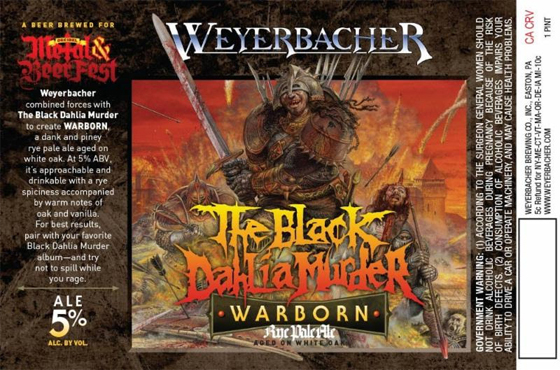 "We're extremely excited to pair with Weyerbacher in the creation of Warborn Rye Pale Ale for our appearance at Decibel Metal and Beer Fest Los Angeles," THE BLACK DAHLIA MURDER front-man Trevor Strnad says. "Named after the closing track of our third album, Nocturnal, Warborn is sure to be a bona fide hit amongst even the most discerning metalhead palette in attendance. The nostalgic BOLT THROWER-esque artwork was originally commissioned by the band in 2009 for a limited run of Warborn-themed long sleeve shirts that were sold exclusively on a European festival tour, and has triumphantly returned here almost ten years later to grace each can of this exquisite craft beer of the same name. The original painting was expertly handled by one John Sibbick, who constructed the iconic futuristic war scene that adorned the first edition of Warhammer 40k and subsequently BOLT THROWER's Realm of Chaos album. Painstakingly aged to delicious perfection on white oak and seasoned in death metal glory, Warborn will emerge victorious!"